A form of coaching that involves interaction between you and my therapy horse, Sophie. Activities are of a somatic nature, where there is a continual focus on the breath and sensations within the body. The activities include brushing the horse, leading the horse (walking without a halter or lead rope), observation, and some goal-based exercises as I facilitate a dialogue of discovery. Your own curious nature and the quality of breath you bring to the exercises with Sophie will create the opportunity to identify patterns of behavior, thoughts, and emotions. The goal of equine therapy is to help you develop your own skills to navigate life on life’s terms. We do this through looking to the horse as a mirror for what is happening inside as well as for perspective that lead to new opportunities and solutions. What is Yoga on Horseback? While sitting on my therapy horse, Sophie, you will experience a gentle yoga practice. This embodied yoga practice focuses on the breath as a means to open the heart and drop into your animal body and connect with your most authentic self. Through an active dialogue and looking to Sophie as a guide to your inner psyche, you will experience equine therapy in a divinely guided way...through the sensient body. 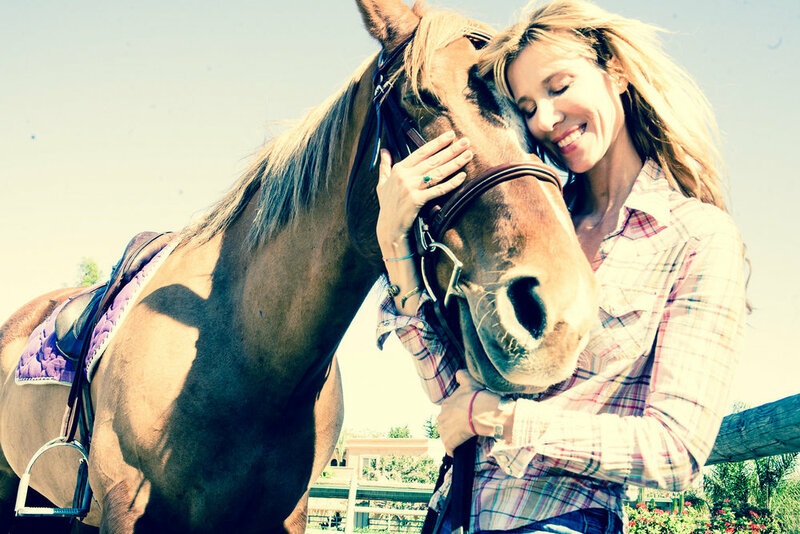 Yoga on Horseback is a unique offering that I created through my practice as both a Kundalini Yoga Therapist and my work as an Equine Guided Educator. I feel this is one of the most healing forms of equine therapy for those that have both the interest and sense of balance on a horse. Recognized as a powerful healing modality for people who have experienced trauma or are navigating life's transitions. Natalie's clients receive empathic listening and based on an open and reflective dialogue she will then tailor a therapeutic experience that allows for a release of what no longer serves you and the sensient awareness of what you would like to create in your life. Her clients often share with Natalie that they feel incredibly calm and relaxed following these sessions and have reported a renewed sense of vitality in the days following. A nervous system 'reset' is how Natalie describes her work with clients. Being with horses allows for us to drop into our own animal bodies and tap into the areas where we hold negative emotions and memories as Natalie guides you through a somatic process to release and surrender. As you are drawn into your body and the sensations you will begin to connect deeper with your own soul and ultimately your most authentic self. Through this somatic experience of tracking the breath in the body and visualizing your heart chakra opening with each breath, you may very well discover your unique gifts to the world. Our bodies hold both positive and negative memories and consequently this is the wisdom of your body. What would you create if you could actually rewire your body for the experience of intense joy, love, abundance? Using the breath, yogic postures, and the sensient awareness of horses, we embark on this journey to the heart. "My experience doing yoga on horseback with Natalie and her sweet angelic horse Sophie was absolutely life changing..."
"Natalie has the ability to help each person she works with to see the best in themselves and others." "The connection I felt with the horses was a truly spiritual experience and I will never forget the day I spent with Natalie in Malibu. My family and I are forever grateful."